Hi y'all! Sorry I haven't posted in awhile... Things got a bit crazy, but I'm back with more photos! 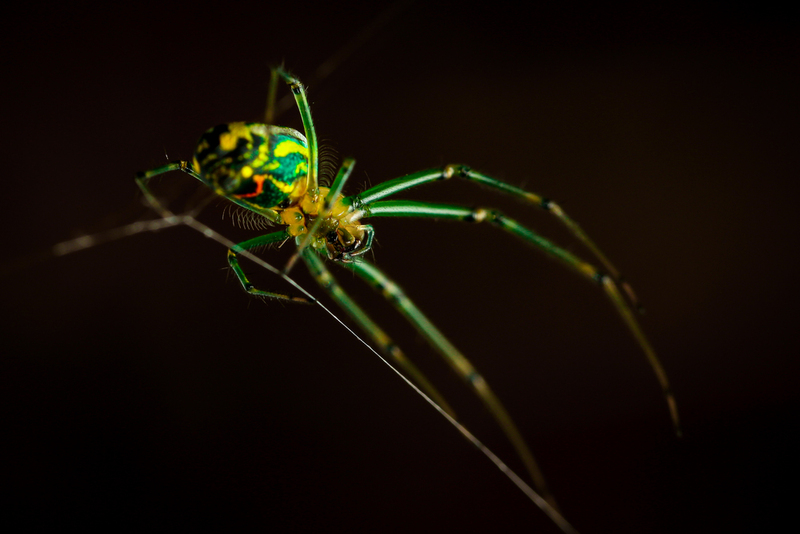 Tonight I give you the Orchard Orbweaver spider - I'm promise it's much smaller than it looks here! For this shot, I had a tripod, a 100mm macro lens and two Canon extension tubes. I also had an external flash mounted on my camera, which I used to bounce light off of a large reflector. The shot was taken in manual mode, with an ISO of 500, an aperture of f/8.0, and a shutterspeed of 1/200 seconds. I also darkened the black background, sharpened the image and added just a tad of vibrance. The background turned out naturally dark, not because it was actually night-time, but due to the nature of using flash. In lightroom I rotated the picture - the spider is actually hanging up-side down, weaving its web. I love how you can see the tiny sensory hairs on the spider's back legs. Today is a day for many firsts. First time posting photos to this blog taken after my PhD dissertation defense. Life got quite busy over the last week! First time using my new Lensbaby Composer with 50mm optic. First time seeing a dragonfly eating lunch. When you see the brightly colored dragonfly, you probably don't think "fierce predator." The dragonfly in the image above is (I believe) an Eastern Pondhawk, or Erythemis simplicicollis. It feeds on small flying insects, and is quite a fierce and accurate predator. It sometimes even preys on other dragonflies! I took the photo above with a Lensbaby Composer and a 50mm optic. The Lensbaby mimics the effect of a tilt-shift lens, producing a "sweet spot" of focus that can be moved around the frame by tilting the lens. The lens is completely manual focus, and the aperture is also changed manually by rotating the lens to change the diameter of a 12-blade aperture device inside the lens. It's quite fun, but can be challenging for macro shots! In order to get better focus on the dragonfly in this shot, I focused using a zoomed-in live-view preview on my camera's LCD screen, as opposed to relying on my eye through the viewfinder. Dragonfly Shot: Lensbaby 50mm, f/2.8, ISO 100, 1/250 seconds. I'm a bit behind on my #AmyShuttPhotoaday challenge, a photo-a-day project for this month coordinated by Amy Shutt of Amy Shutt Photography. This post is from the theme "door." Doors, especially colorful doors, are always photogenic. When I was young, I had an obsession with The Secret Garden, the book and I believe the 1993 movie. Something about the door hidden in the moss, and the secret old-fashioned key - it stole my heart. So whenever I see an interesting door, I try to take a picture of it. I also passed through a door today - I walked in a PhD student, and walked out a Doctor! But inside the PhD defense, I learned more about what I didn't know, and what I have yet to learn, than I spoke as an expert. The door shot: 40mm lens, ISO 100, f/4.5, 1/100 seconds. As my Ph.D dissertation looms near (3 days! ), my time available for blogging shortens. I'm trying to stay "bright" in my disposition! Luckily the sun was shining all day! 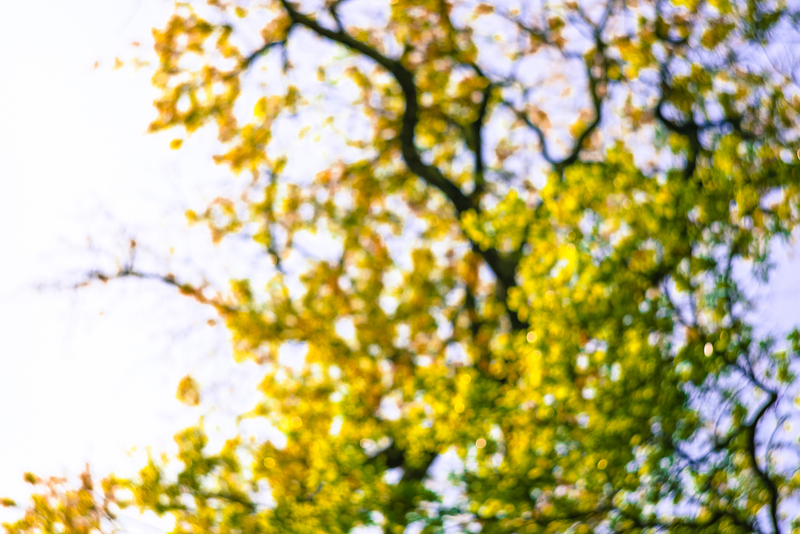 So I took my Petzval lens outside for some artsy "bright" shots. In the shot above, taken straight up looking at the top branches of a mighty oak tree, I purposely threw the whole scene slightly out of focus. I took the shot above with a Petzval lens, ISO of 100, shutterspeed of 1/500 seconds, and an aperture plate of 1/5.6. In Lightroom I played with the colors a bit, giving the scene a warmer and brighter tone. I also love the bright sunlight shining through the branches of a dogwood tree below. The Petzval, especially in black and white, gives the photo a film quality that I love.